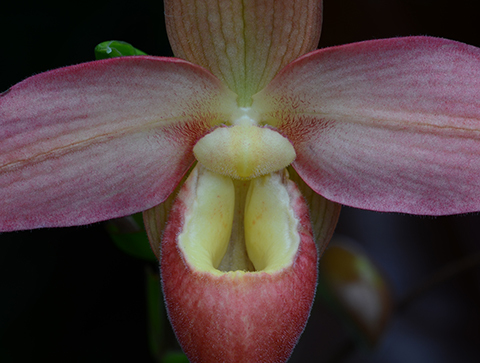 The pollen masses (pollinia) are hidden behind the shield-shaped staminode in the center of the flower. 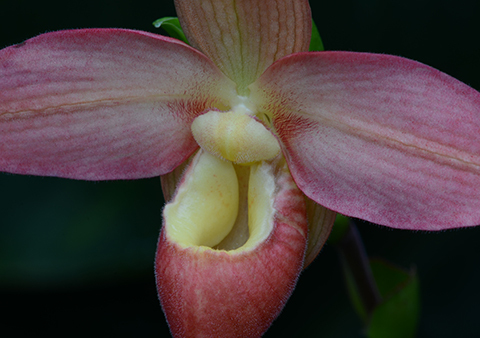 Phragmipedium Cape Sunset flowering at the Fuqua Orchid Center. The yellow pollinia are just barely visible over the top of the staminode. How do you explain the appeal of slipper orchids? What is it about slippers that makes them irresistible? I think it's the pouch, or toe cap, of the slipper that is the lure. Very few of our visitors can resist the urge to get closer and peer inside. What's inside that pouch? What's it for? 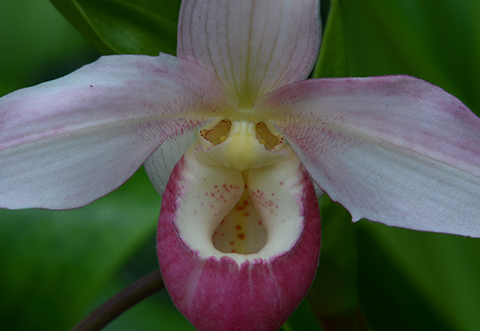 It's a trap, actually, for the insect that pollinates the slipper orchid. For an insect what's inside that pouch is a convoluted and probably exasperating journey in search of an exit. Once underneath the tightly inrolled lip the insect is forced behind the shield-shaped staminode where it collects or leaves behind the pollinia, and finally escapes. The pouch is a trap to ensure fertilization. No insectivory is involved. If you love slippers you won't want to miss our spring Orchid Daze 2013 display opening February 9! Our display will feature slippers of all sizes, shapes and colors.